This bedroom is a perfect example of how crown and panel molding can be used to draw attention to the bold contrast of a room's surrounding colors. Many times, paint color is the single most important factor when determining how eye catching you want your molding to be. The silk palm tree in the corner gives this well dressed room a California feel, while the mahogany bed frame and dresser perfectly complement the dark flooring. Photographically, the finishing touches say it all- That being said, the champagne set-up resting upon the plush bedding perfectly depicts the casual luxury of this room. This room incorporated a plain molding similar to the CM-1105. In rooms where you have a ceiling that steps up you can also install a crown around the perimeter of the taller part of the ceiling. The lower portion of the wall provides a great contrast between the dark flooring and deep beige wall color. 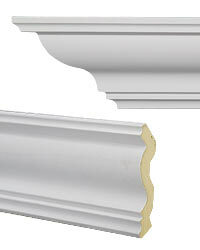 They used a simple panel molding like the ET-8711 to create boxes to add detail to the lower portion of the wall. The upper portion of this area is finished off with a simple chair rail.